This is the best Android Wear smartwatch out there, but it's also the most expensive. TAG Heuer has done a great job, but Google is the weakest link. Despite being far from perfect, we loved TAG Heuer’s first attempt at a connected watch. So we were incredibly excited when an invite to the launch of TAG’s second generation smartwatch landed on our desks. Now called the TAG Heuer Connected Modular 45, the Swiss watchmaker has addressed many of the first generation’s issues, and added in something we weren’t expecting - modularity. T3 has been wearing the new Swiss Made smartwatch for a week. This is our full review. TAG Heuer claims there are over 4000 options, some tasteful, and some... not so much. The good news is you'll be able to design a smartwatch that matches your style and personality. The basic Connected watch is an Android Wear toting digital module. There have been a few connected watches which were ‘assembled in Switzerland’, but the Connected Modular 45 is the first to achieve a ‘Swiss Made’ certification. It's very similar in appearance to the first generation, but feels more weighty (62.5g vs 52g,), solid, generally better made, which is a reflection of the 'Swiss Made' certification. The biggest difference over the previous generation is that the rear casing, which is now made from steel rather than plastic. That makes it feel a lot more premium, and more like a £1000+ watch. Not only will you be able to choose different straps - you'll be able to choose between several options of case material, bezel colour, buckle type and lug metals. These options range from quite basic (but still pretty swish) steel and titanium, up to opulent rose gold and diamond encrusted bezels. We really like the understated blue-on-blue model we've been testing, although our favourite, money no object spec, would be matt black bezel and rose gold lugs. In our opinion, the brighter colours look cheap. If you decide you also want a mechanical timepiece, TAG Heuer will also, generously, sell you a mechanical module, which is compatible with all of your existing straps and lugs. There will be several mechanical module options, including a COSC-certified tourbillon (which will set you back somewhere in the region of £14,000). If you're not sure what a tourbillon is, check out T3's guide to buying a mechanical watch. We've spent a while considering why you'd want to buy a mechanical module over a similarly price TAG Heuer piece (a Carrera, for example), and it's difficult to come up with a reason. It would useful to swap in if your Connected module ran out of battery, and it could become a collector's piece someday. Once you design your 'starter' watch online there's nothing is stopping you from adding to your collection over time. So really, you're buying into an ecosystem. Our worry is that TAG Heuer won't continue to support the system (like LG dropping the G5 modules after 12 months). The straps and other modules are very well designed, making them easy to quickly swap between them. We could swap straps under 20 seconds, without needing to read an instruction manual first. It's a neat design. The watch measures 45mm in diameter and 13.75mm thick. It's chunky, and certainly not suited to smaller wrists, but if you're fond of sporty, oversized watches (like us) this will be right up your street. Jean Claude Biver also announced a smaller, unisex model will be released in October, measuring 39.5mm. The TAG Heuer Connected Modular 45 is now water resistant to 50 metres, which matches the Apple Watch Series 2 for ingress protection. The first generation's screen was its biggest let down, it was low resolution and dull. Thankfully, TAG Heuer has fixed this with the Modular 45. The new model features an AMOLED display that's 1.39-inches in diameter with a 400 x 400 pixel resolution. That gives a pretty impressive 287 ppi, as well as bright and saturated colours. It's not as good as the Apple Watch or Samsung Gear S3, but it's perfectly acceptable. The display is 'always on', which is a positive point. But when not in active use the Connected will only display a basic monochrome version of your selected watch face, which is slightly disappointing. It's slightly smaller than the previous generation's, but not so small that we felt hampered by it. It's powered by Intel's Atom Z34XX processor, the new Modular model has 512MB RAM and 4GB storage. Android Wear runs nice and smoothly on it. The only problem we had was starting Google Assistant, which stalled every time we opened it, but hopefully this can be fixed with a software update. The smartwatch packs a 410 mAh battery which TAG claims will last around 24 hours. We found that you'll still need to charge it every night, but the watch will last from morning to late evening no problem. There's GPS and Wi-Fi on board, to enable semi-autonomy away from a smartphone, but no 4G support or heart rate sensor, so it's unlikely to serve as a proper running watch. There's also no speaker, so you can't take calls on your watch. The TAG Heuer Connected Modular 45 will come running Android Wear 2.0. This is the latest and greatest version of Google wearable OS, bringing the ability to run standalone apps, Google Assistant, an improved UI, and watch face complications. You can read a full run down of Android 2.0 benefits here. iPhone users will see the biggest gain, with the ability to download and run third party apps which were previously unavailable. You'll also have the ability to set up Android Pay, which will enable you to make contactless payments straight from your wrist. Unfortunately, Android Wear 2.0 isn't the big improvement we we hoping for, it definitely seems like the weakest link here. There's no consistency in the UI, limited apps, and Google Assistant isn't as smart as we would have liked. This isn't TAG Heuer's fault, and we're hoping it's something Google is working on fixing. TAG Heuer has had some influence on the software, with watch faces and custom alarm/timer/stopwatch apps. The refreshed apps are really neat updates on the standard Android Wear apps, and the watch faces are attractive and customisable. We are very impressed with the TAG Heuer Connected Modular 45. It's our favourite Android Wear smartwatch, ever. But then, you'd expect it to be excellent, because the Modular 45 is also one of the most expensive smartwatches you can buy. Prices start at £1400, and can raise significantly depending on what modules you pick. 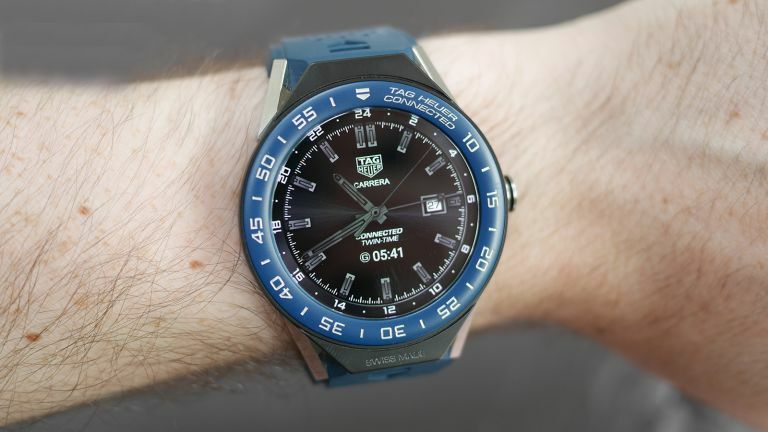 The weakest link here is Google's wearable OS - it's still miles behind Apple's watchOS and Samsung's Tizen, and that's a shame because everything TAG Heuer has done is brilliant. If you're after a premium smartwatch for Android - this is the best option out there. Or maybe the best analogue watches are more your thing?